The asphalt-industrial complex—otherwise known as Big Asphalt—took control of our cities and towns. Here’s how we can take it back. In America we have 2.5 million miles of paved roads, and an estimated 800 million parking spaces. Dwight Eisenhower famously warmed America about the “military-industrial complex.” I think he should have warned the country about the “asphalt-industrial complex,” which has done more damage to where you live. It has transformed America, and not in good ways, and created the largest asphalt paving industry in the world, producing 400 million tons annually. The paving promotes more driving, which in turn raises the demand for paving. In the last 100 years we paved a total area that is half the size of Pennsylvania—based on the paved parking and road estimates—and this requires ongoing service and maintenance, which feeds the industry perpetually. American industrial and professional sectors have evolved to serve the complex. Big players are the asphalt, aggregate, and ready-mix producers, and the paving contractors. These include Oldcastle Materials and The Koch Industries—not household names, because you don’t drive to the big box store to buy asphalt. You drive and park on asphalt. Our retail industry, which used to serve neighborhoods and communities, now depends on asphalt. The biggest corporation in the world by revenue, Walmart, would not exist at anywhere near its current size without Big Asphalt. The automobile and trucking industries also are built on pavement. The oil industry feeds the asphalt-industrial complex. 1) Road-building standards often make us less safe because wide roads promote speeding that kills thousands of people a year. Since 1899, 3.71 million Americans, mostly young and healthy, have died in motor vehicle accidents—more than all our wars combined. Injuries, many of them debilitating, have topped 150 million. 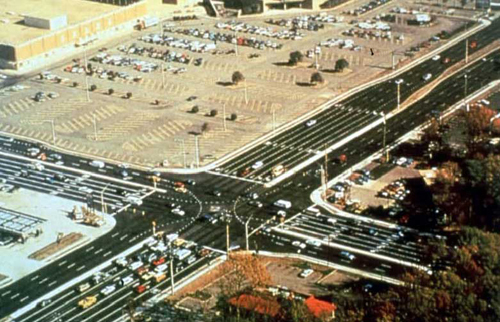 2) The big arterial thoroughfares lined by parking lots devalue communities and suppress economic activity. 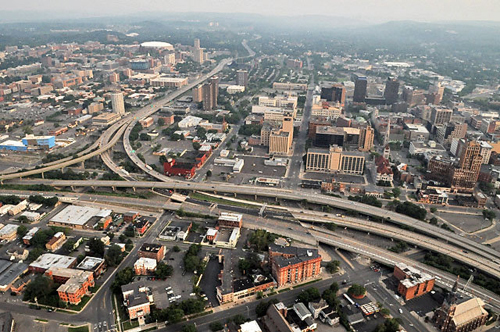 The values of main streets and downtowns are three times that of newer, Big Asphalt, “edge city” commercial areas, according to one recent study. This cuts into government revenue and raises the cost of services. 3) The automobile-oriented areas damage our health by adding to obesity and diabetes and reducing opportunities for exercise like walking to school or to parks. 4) Impervious surface is the biggest source of water pollution today. 5) Directly and indirectly, the asphalt-industrial machine may be the greatest generator of carbon emissions in the world. The US produces two times the carbon emissions per capita as many other fully industrial countries–such as Japan, the UK, Sweden, and Italy—largely due to the automobile-oriented lifestyle enabled by Big Asphalt. 6) Big Asphalt reduces choices in how to get around, forcing many to spend more of their hard-earned dollars on automobile expenses. 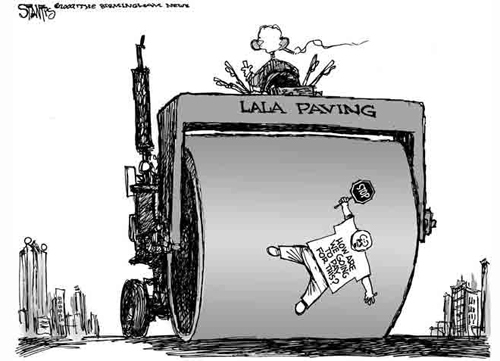 8) Big Asphalt has fed at the government trough for 100 years, hitting taxpayers whether they drive or not. Gasoline taxes and user fees — all levied by government — pay for only half of road spending, according to the Tax Foundation. The rest comes out of general funds. Minimum parking requirements determine the size of parking lots—and that’s another direct subsidy of the machine. The complex has its own research arm called the Texas Transportation Institute (TTI), whose annual “congestion index” is used to justify expansion of America’s pavement. The complex has determined the form of the built environment in a large portion of our metro areas. Historic street grids in cities and towns predate the modern asphalt industry. The complex stuck its tentacles into these places, threatening to destroy them. Grade-separated highways tore urban neighborhoods apart and blocked them from amenities like waterways or main streets. Thousands of historic buildings were leveled for parking lots. 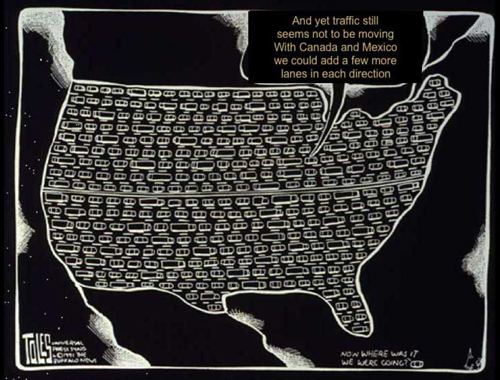 Many more urban freeways were planned, but citizen groups rose up in the last century to protect their neighborhoods and beat back the complex. The greatest leader in that war was a writer and local activist named Jane Jacobs, but unsung heroes also took part in battles that saved many neighborhoods in cities coast to coast. Many people today are fighting this battle, including new urbanists (cnu.org), the folks over at Strong Towns, complete street advocates, bike-walk activists, and others. In historic cities and towns, we still have choice in how to get around. We can walk, ride a bicycle, take a train, use Uber—or drive if we wish. In most of our nation, the asphalt-industrial complex determines how we travel. The complex that we created in America is now spreading to other parts of the world such as China, the Middle East, and Latin America and paving those places, too. In order to build better a better world for ourselves and our children, we have to take back control of the built environment from the asphalt-industrial complex. But where to begin? The first step is to realize that we don’t need this asphalt-industrial complex. Yes, we need asphalt. And we need roads. But we don’t need nearly as much asphalt as we have built in our cities, towns, and especially our suburbs. We’d be far better off with communities that are walkable, bikable, and transit-friendly—that have networks of small blocks and streets where people can get around in many different ways. In the 1960s, roughly half of public school students walked to school. By 2000, that number had dropped to 13 percent. That’s the asphalt-industrial complex at work. We can starve the asphalt-industrial complex by shrinking down thoroughfares, travel lanes, and intersections, and getting rid of the requirements that demand more and more parking. We can remove unnecessary in-city freeways and We can make room for more bicycle lanes, sidewalks, and outdoor cafes. We can use techniques like Tactical Urbanism to show how places can be improved with less asphalt. We can rebuild communities based on the walkable, mixed-use neighborhood model, not the sprawl model. When traffic engineers tell us that at enormous intersections, uncrossable on foot, are necessary, we can simply not believe them. We can set them straight. America looked much different before Big Asphalt. You could walk from coast to coast, through cities, towns, and countryside. That was before we had the same franchise restaurants and commercial strips in every built up area lining enormous unwalkable arterials. That was before the countryside around every city and town was gobbled up with parking lots, massive thoroughfares, and cul-de-sacs that feed the complex. Above—Big Asphalt, and a vision of Big Asphalt transformed. Urban Advantage. Our transportation system is important, and we must be able to drive in addition to walk, bicycle, take transit, and use rapidly evolving transportation technology. But we shouldn’t let asphalt continue to rule our lives. On the contrary, we take back America from the asphalt-industrial complex. We peel away its support network by demanding that the transportation engineering and the DOTs work for us—not the asphalt-industrial complex. It won’t be easy and it won’t be quick, but our country belongs to us—not the paving industry and the special interests that depend upon it. Syracuse—the tentacles of Big Asphalt invading a downtown. We can and should replace many of these in-city highways with historic street grids.